Sunset over Staithes on the Summer solstice. I obviously don’t get out often enough….as I have been ridiculously excited about my activities over the last two weekends - both painting related of course! Firstly, I travelled to Staithes in North Yorkshire for a painting workshop with Haidee-Jo Summers and then, this past weekend, my paintings were in an art exhibition at a local festival. I’ll cover the latter in a subsequent post so I’ll tell you all about the weekend in Staithes here. We arrived on the Thursday evening to a warm welcome and lovely dinner after a long car journey from Aberdeenshire. After dinner, a group of us climbed the hill to look out over the village as the sun disappeared on the Summer solstice. It was a beautiful sight and a good omen for the weekend ahead. After introductions on the Friday morning, our small group headed out and watched Haidee-Jo paint a demonstration of a small boat, working really quickly as the tide was coming in fast. That first day was all about thinking - and painting - only in “values”. For those of you new to painting, that is to say we were painting in varying shades of grey - five, including white and the darkest dark. This really focuses all your attention on the lights and darks of the scene. This is absolutely critical to achieving a realistic representation of anything you paint, be it a landscape, a portrait or a still life. Accurate values, more than anything, have the power to make or break a painting. I have been painting in oils for 20 years now so it is something I was already aware of but it was illuminating to do a focussed exercise on it. I’ll admit, with a toddler on the go, I rarely have the luxury of doing painting ‘exercises’ at all and I am always impatient to get colour onto my boards when I eventually get to paint! In saying that, I enjoyed stripping things back to basics and found it strangely relaxing. 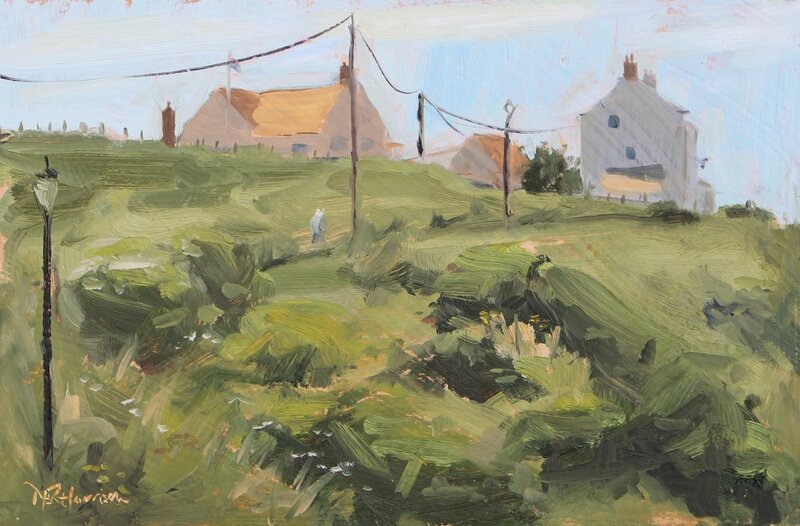 I painted three scenes in varying shades of a beigy-grey that day and, by the time we moved on to colour the following day, I felt that I did have a sort of heightened awareness for picking out the different values in my landscapes (and also how they related to one another). As an aside, there’s a good section about how values relate to one another in Haidee-Jo’s book, “Vibrant Oils”. As another aside, when you’re painting outdoors in a public area, people continually look at your work (as well as chat to you, which is lovely). So I was amused to learn from my Mother-In-Law (who had come along to look after the little one) that she’d overheard a couple discussing the paintings they’d seen by the group, noting that they were “very good but a bit drab”! She swiftly defended us, saying that we were spending the day doing tonal studies! The following day, we worked with a limited palette of four colours. After another demonstration by Haidee-Jo, where she worked away at her board revealing a lovely painting from a seemingly dull and uninteresting harbour wall, we set to work with our four colours. That doesn’t sound like a lot but, famously, Anders Zorn, Sweden’s master impressionist painter, often used a palette of just black, crimson, yellow ochre and white. I like to work from a fairly limited palette anyway as I think the more you learn to mix colours, the less you rely on the colours from the tube and it’s a bit like magic isn’t it, mixing blue and yellow and a lovely green appears out of nowhere! Practice at mixing colours also gives you confidence that you can mix pretty much any colour you want if you have the right basic palette of primary colours. By that, I mean the right basic palette for your preferences as I don’t really believe there is a wrong or right palette, and I vary mine slightly on how I feel or what I plan to paint. Another benefit of working with a limited palette is that you get a lovely colour harmony throughout the painting - although that can come at the expense of matching the colours you actually see in nature. That day in Staithes, I used a red I don’t normally use (alizarin crimson) and I loved it and will probably use it again more regularly. I enjoyed this process and got lovely comments from members of the public and my fellow artists on the painting I did that day. You know in cartoons from the 70s and 80s, where a character is about to run off very quickly and their legs become a circular blur as they dash off? Well that’s how I felt on the third and last day of the course. As much as I had found the first two days really valuable, I was itching to get painting with a palette full of juicy oil colours (I think I used about nine different colours that day). In circumstances where you’re raring to go and short on time (we had to leave that afternoon to drive up to Edinburgh) you can get a bit overwhelmed by the wealth of scenes to paint. It sounds a bit naff I know but there’s beauty everywhere if you care to look for it and Staithes really has no shortage of paintable scenes. There are pretty little flower-festooned pockets, nooks and crannies everywhere, let alone the ever-changing blues and greys of the sky and sea. 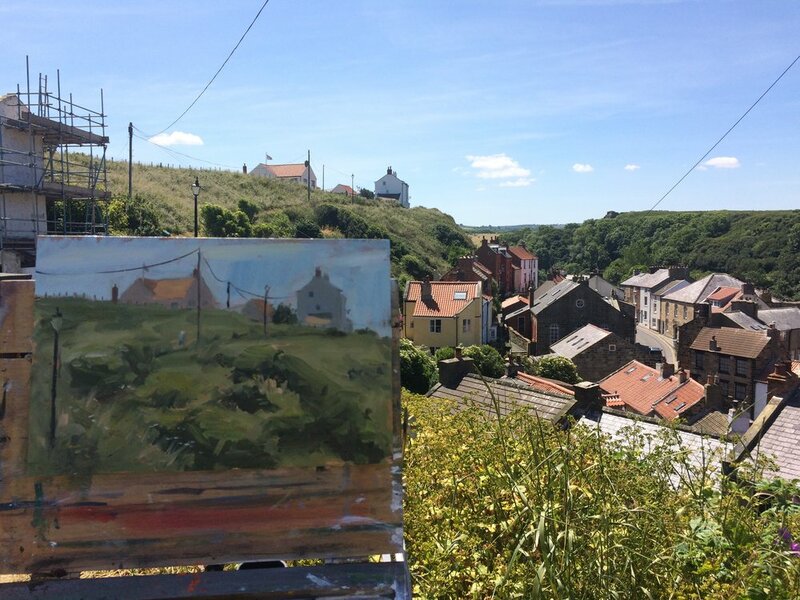 I (literally) dragged my painting gear to the top of the hill overlooking the whole of Staithes, in the stifling summer heat and - fortunately - I found two scenes that caught my eye. As yet another aside, I’m always amazed that if you give various painters a particular scene, not only are their styles of painting likely to differ, but what appeals to them about the scene is usually different too. I love this seemingly endless fountain of inspiration into which we can all dip! The first scene that caught my eye at the top of that hill was the interesting values of the silhouetted rooftops of a few houses on the very top of the hill and how their structure, in tandem with the structure of some telegraph poles and wires, contrasted with the wild abandon of the unkempt grasslands around the path leading to the houses (is “wild abandon” a bit too Mills & Boon?!) . I worked quickly and was pleased with the freshness of the brush work. When I had finished that painting, I pretty much turned around and sat down on a bench (I was feeling pretty weary under the burning hot sun) to paint the sea cliffs to the South of Staithes. It was really exhilarating up there above the village, in amongst the shrieking gulls. I felt that everything really came together with that second painting and I was happy that I felt I’d captured something of the majesty of the cliffs and also the very energy I felt in creating the painting. Again it probably sounds a bit naff but sometimes when the energy going into a painting feels right, it almost seems as though that energy is embodied in that final painting. I really do need to get out more often, don’t I?! All in all, it was a fantastic weekend. This is already a long post and I could rhapsodise for ages about how much I enjoyed it - I haven’t even started on the delicious meals and the amazing ice cream from the shop called “Cobbles”, which is just beside Staithes Gallery. All my fellow painters were lovely and we all encouraged one another. I would say there was a range of experience amongst the painters on the course but no complete beginners. The organiser of the course, Al at Staithes Gallery, was wonderful and went out of her way to arrange suitable accommodation for me, my Mother-In-Law and my toddler! In fact, it was studio accommodation which was actually the converted studio of the artist Dame Laura Knight no less! If you are not familiar with her work, you should have a look at the wonderful catalogue at www.damelauraknight.com/ . “On the Beach 1909” is a particular favourite of mine - I think the colour/light is reminiscent of Joaquin Sorolla. Staithes is the unsung hero of my brilliant weekend. It is such a gorgeous place and I really don’t think Google images does it justice! It is literally a breath of fresh air down by the seaside and it really is just bristling with scenes waiting to be painted. Down by the Beck in Staithes. The Dame Laura Knight Studio.